Wahooou!!! 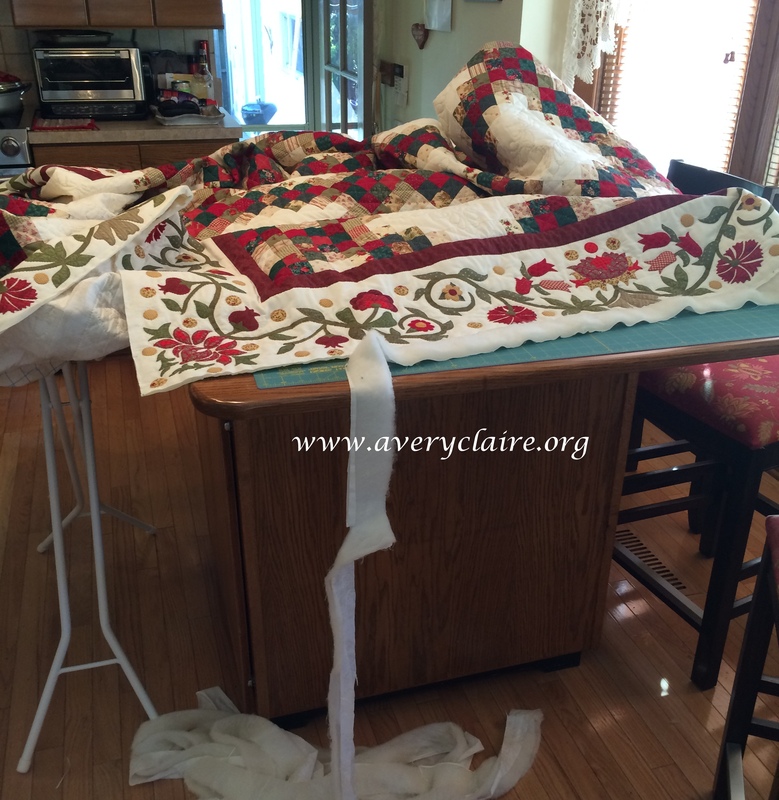 This is the best post about quilting I ever read. You know what? It reminds me of a very good book you offered me (us) for Christmas at the beginning of our friendship so many years ago. It speaks of lovely things, wisdom and well organized way of life. I loved it and still cherish it. And on top of that you provide us with the photograph of three cute ‘lady bees’. You look wonderful. You made my day. 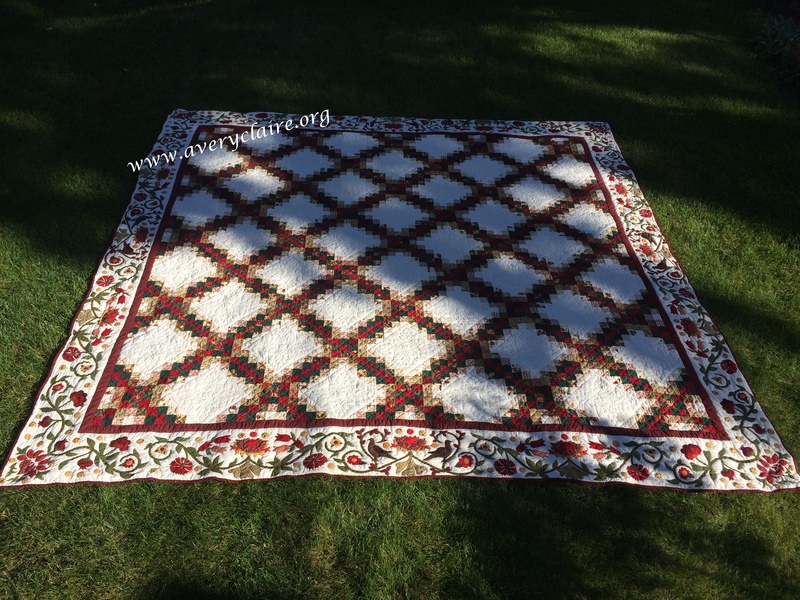 I shall do something with your advice as I do a lot of hand quilting on large patchworks. I look forward to read more here. The quilt is just fantastic! SO beautiful. But it’s made even more perfect by this story of finishing it with the help of friends. 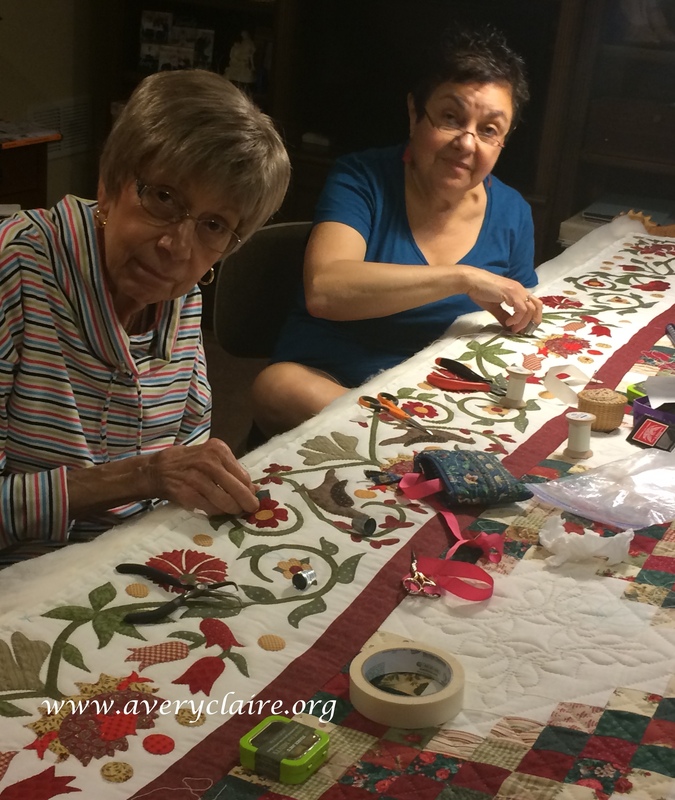 I think the communal tradition of quilting is one of the things I like best about the craft–many loving hands, working together! What a great story. Thanks so much for sharing your gorgeous quilt! Love the border. Fantastic! Your quilt is stunning, and I am very happy to get a glimpse of your quilting friends after hearing so much about them! I look forward to seeing this masterpiece in person very soon. Hooray! I’m so happy for you that your quilt is finished. How beautiful it is too! I loved hearing about your quilt group too. We used to have a quilt group once upon a time but it fell by the wayside. Very sad. Anyway, congratulations! Love your quilt! Your quilt is unbelievably beautiful. 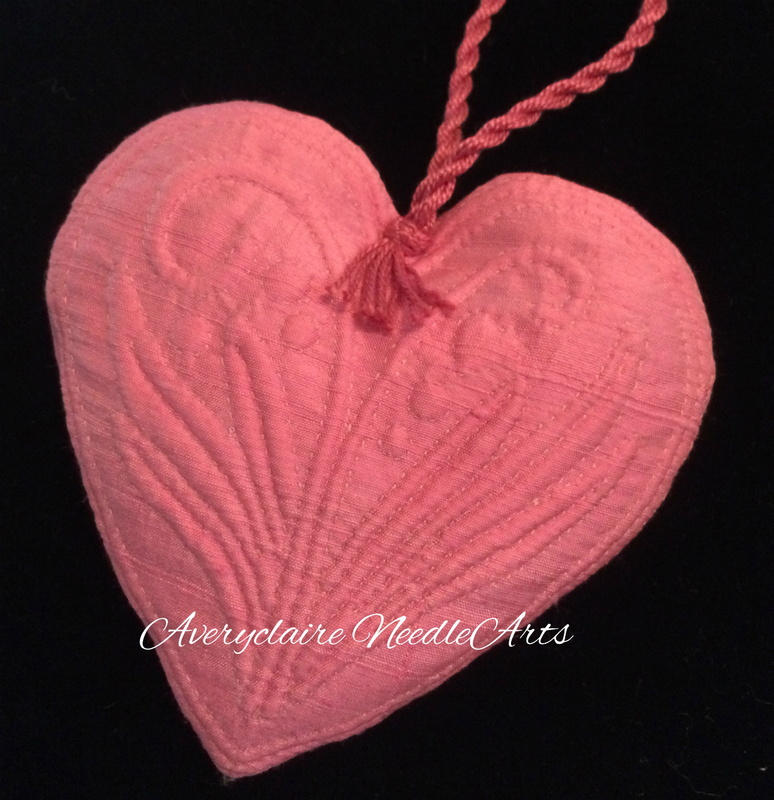 Every stitch was placed with care, love and friendship. What an amazing heirloom piece you have created with the help of your friends. 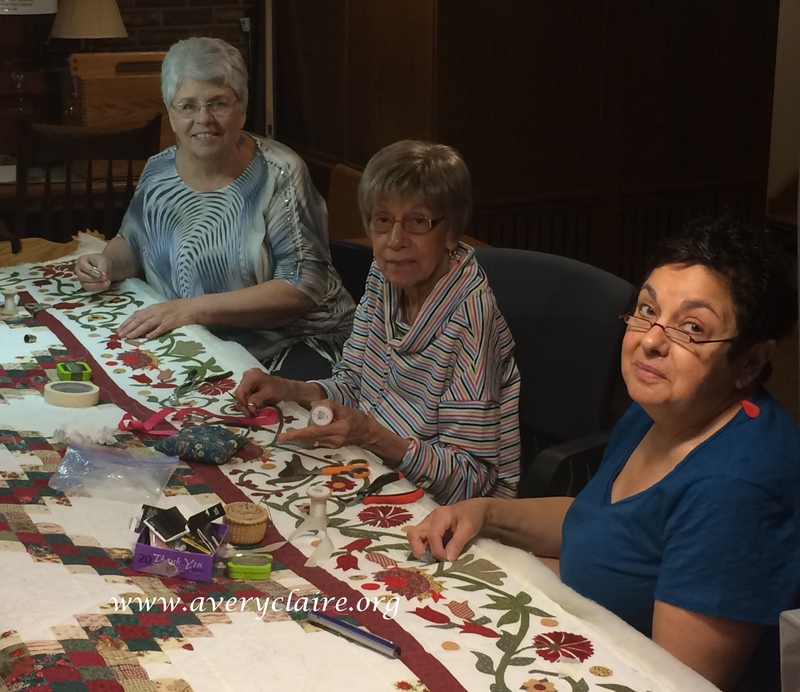 The 3 of you are very fortunate to have created such a bond through quilting. Love all the pictures. Thanks. Congratulations!! 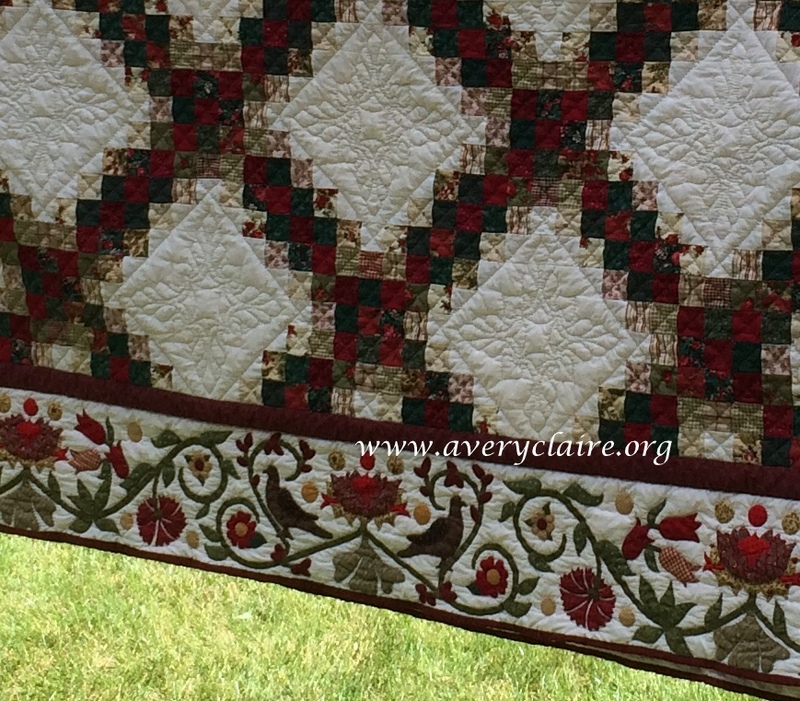 It’s a gorgeous quilt and I LOVE that you and your friends quilted it together. I’m not sure how a quilt could be more special. Please keep posting about what your group is working on! Your quilt is magnificent! Absolutely stunning! Those borders are so very beautiful. Thank you for sharing with us – sharing the finished quilt and even more so, sharing the story of your friends and the bond you have built around the frame. 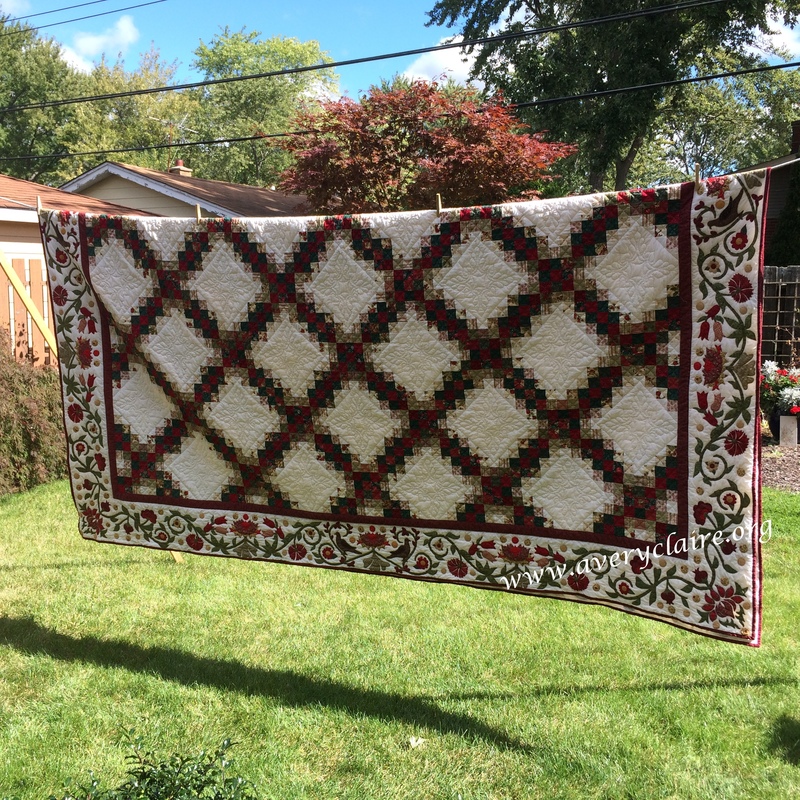 I came over from the Facebook group to see this in more detail…it’s beautiful, and what a nice story about you all quilting together. I put my sheets and spreads out on a laundry line in good weather so I know exactly what you mean about the lovely fresh scent! The border on this is amazing…so much intricate work. OH, your quilt is just breathtaking!! I can’t imagine all the love and hard work you put into creating it, but how wonderful to have such good friends to lend a hand! Congratulations on a truly lovely heirloom! Oh my, such a terrific quilt. 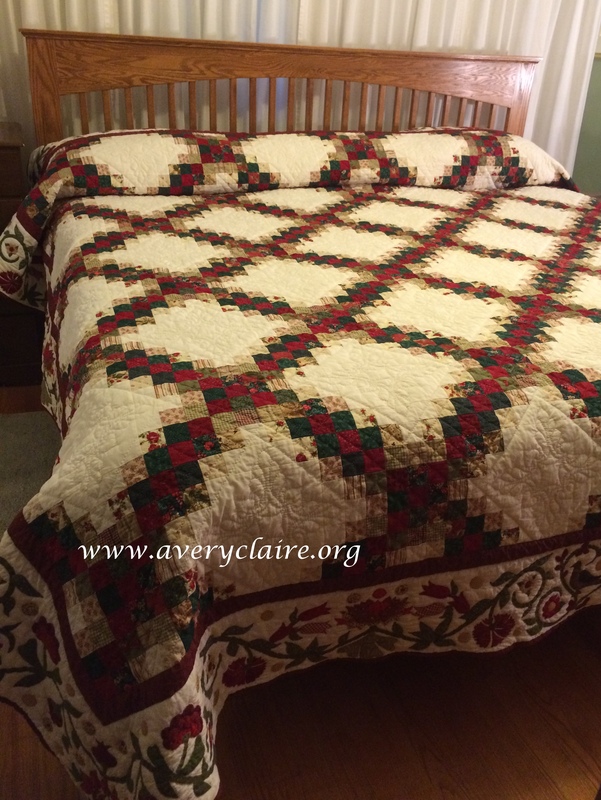 And everything is handquilted. I’m definitely in awe. 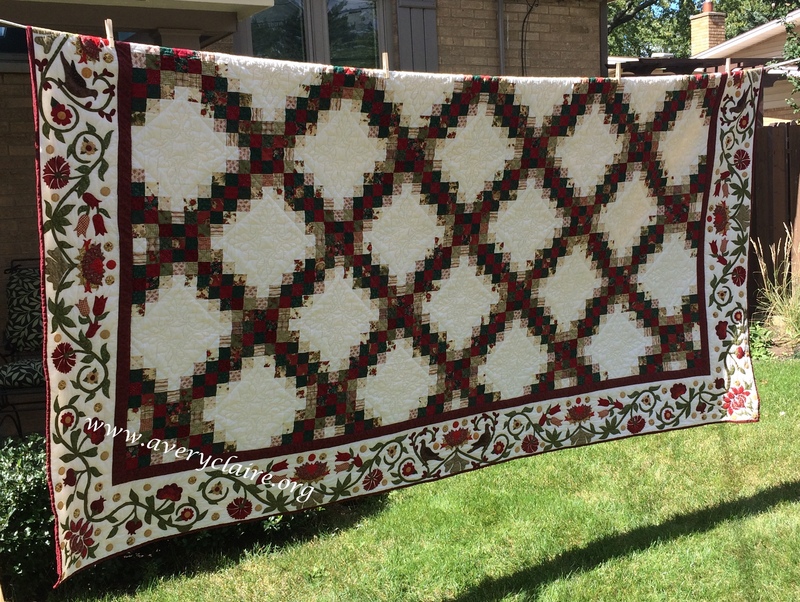 Your little quilting group is just wonderful, it reminds me of these quilting bees that you sometimes meet when you read a book with a quilting theme. 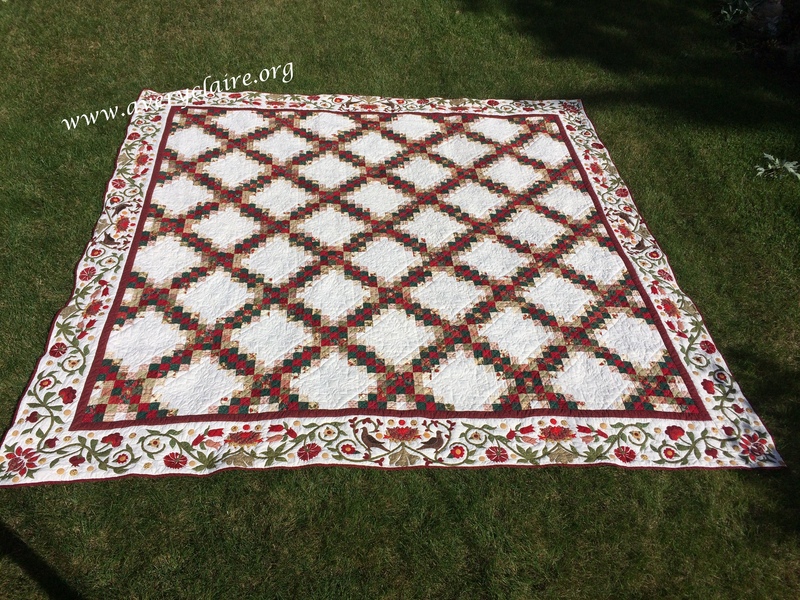 What a very beautiful quilt, the colours are lovely and the border design gorgeous. How wonderful to have such friends to share and enjoy your hobby. 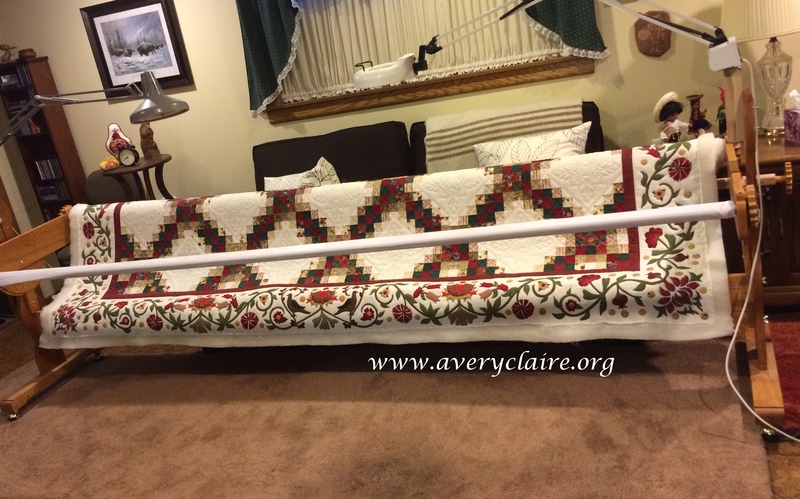 I wonder how long this quilt would have taken to make if just you had worked on it.